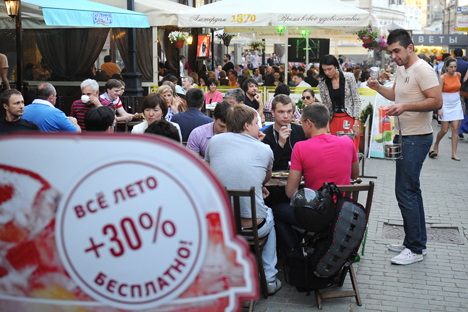 Authorities to double the number of cafés and restaurants in the city. Officials believe Moscow’s culinary market is short on diversity because most cafés are run by chains. Moscow has one café or restaurant for every 1,570 citizens, compared to one for every 580 citizens in London and one for every 90 in Tokyo. To rectify the situation, city authorities have proposed a business plan. City authorities in Moscow have come up with a plan to diversify the capital’s fine dining scene. The concept includes a series of measures, including promotion of a “Moscow cuisine” brand and improvement of the city’s culinary image through the opening of quality cafés and restaurants. A network of fast food and mobile cafés will also be opened. There will be a culinary school and “culinary faculties” set up at universities to train public catering specialists. A culinary museum and culinary theatres will be established, and Russian food festivals will be held. There are plans to open a major wholesale food market within the bounds of New Moscow, specifically to sell Russian-made products. One interesting proposal is to organize “home lunches” for foreign tourists. A database will be created to list Muscovites who are prepared to host foreigners, teach them to cook Russian food, or simply treat them to a traditional Russian lunch. Being aware of the shortage of rentable space, city officials plan to use “alternative venues,” such as rooftops and libraries. They even intend to open public catering establishments near popular libraries in the center of Moscow, says the deputy head of Moscow’s trade and services department, Alexander Ivanov. In addition, officials are planning to directly tackle the key problem of the shortage of rentable space in the capital. Ivanov says negotiations are under way with the Moscow Property Department, with regard to making a quarter of the city’s space available to catering establishments at a discount rate. Ivanov has not ruled out that Moscow might set up a public catering council to monitor implementation of the new strategy. Such councils exist in Toronto and London, and they have proved effective. Arkady Novikov, a restaurateur who works in Moscow and London, says he already feels change in the authorities’ attitude toward public catering. “The Moscow [municipal] government is taking many steps,” says Novikov. “For example, bureaucrats have sped up the issue of permits for the opening of summer verandas and restaurants and of alcohol licenses. Bureaucratic red tape has diminished several times over. I can say from my own experience that many people want to open catering facilities, and they are succeeding." “In fact, the bureaucrats have put in place a framework for development, and now people who would like to take advantage of these privileges must come forward. These people need not necessarily be businessmen or catering professionals. It suffices for them to have some culinary skills. Such people can open a small family establishment. There are many home restaurants in Europe and we can try to do it here. This would be a new departure for Moscow,” says the restaurateur. Where can you buy good bread in Moscow? Novikov notes that he opened four verandas this summer and his colleagues were doing the same. “The process benefits all parties — taxes, the tourist infrastructure and comfort,” he says. Alexei Zimin, editor-in-chief of Afisha-Yeda magazine and co-founder of Café Ragout, takes a more guarded view of the plans by Moscow officials. He says the concept should be written with due regard for the actual processes that are going on, and entrepreneurs should be offered various options for supporting their business.